This tour offers an english speaking Egyptologist guide who will accompany you to visit the catacombs of KOM El-Shokafa, Pompeii's Pillar which dates back to the 3rd century. It is over 25 meters high, and it is made of granite, and it is the last of the remaining relics of the Seraphium. 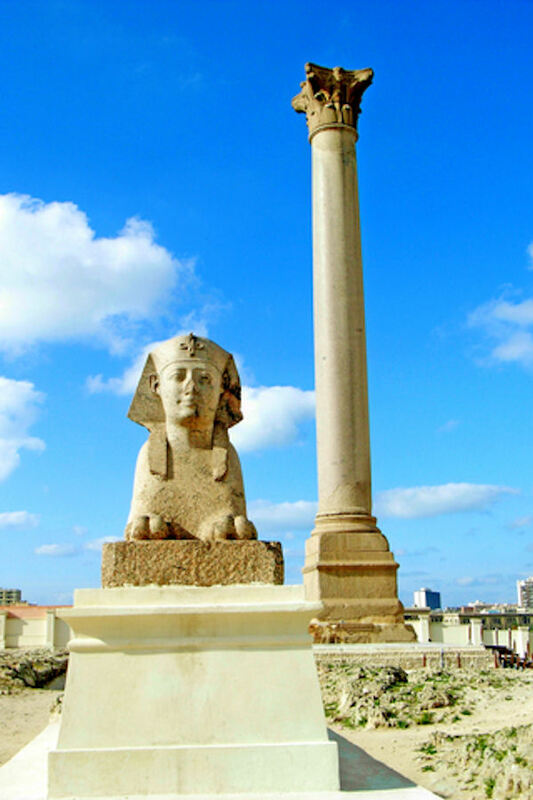 The Pillar was erected in honor of Emperor Diocletian, Roman Amphitheater, Fort Qait Bey. You will then continue on and visit Alexandria library. The Library was reconstructed by building the new library in Selsela at Shatby which is beside the conference center. The library is one of the greatest cultural and scientific centers that specialize in the affairs of literature, civilization, sciences and arts of the area so this attracts scholars from all over the world! After the Library, you will visit the Royal Palace of El-Montazah. Finally you will be escorted by your guide back to the cruise in Alexandria Port. Please note: The Library is closed on Friday, in this case we can skip this visit and arrange the national Museum of Alexandria instead. Bring your Camera. It is important you are on time for tour departure as this tour is a part of a secure convoy of vehicles which depart the pier together.